Today we are taking a look at the 120mm Lepa Vortex fan. The key feature Lepa has designed into this fan is its vortex frame, which according to Lepa, “generates a powerful air twirl that concentrates the fresh air and leads it directly to the hot spots of the system.” A regular fan tends to push air in a large area in front of it, with a lot of the air not concentrated in one direction. The Vortex claims to be able to funnel the airflow in a singular direction. If this proves true it could make for a great case fan that is able to precisely direct air to the hottest areas. 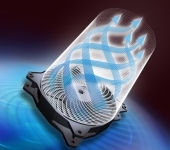 Vortex frame design integrates air flow for better cooling performance. PWM speed control for the best balance of performance and silence. Ultra silent spinning for case cooling solution. 8 Comments... What's your say? It is an interesting fan. Perfect for what you are describing. I actually have it installed as a front intake in my case pointed directly at my GPU.